WE LOVE YA, WE NEED YA! Stanley Auto Group has served Brownfield for almost a decade. 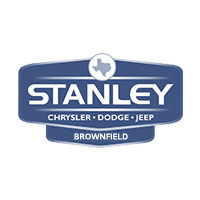 We are excited about Stanley Chrysler Dodge Jeep Ram Brownfield being one of our newest stores, helping Andrews, Eastland, Sweetwater and West Texas drivers find a new Chrysler, Dodge, Jeep, or RAM vehicle or even a pre-owned vehicle. If your family has been growing and you’re looking for an acclaimed 8-passenger SUV to tow your loved ones around town, Stanley Chrysler Dodge Jeep Ram Brownfield has a diverse selection of 8-passenger SUVs for sale in Brownfield. Check out our new and used inventory below, and then read on to find out why Stanley Chrysler Dodge Jeep Ram Brownfield is your best bet for the best deal in town. Share your phone number so we can contact you quickly with our best offer! Share your email to receive discounts and price drop alerts on this vehicle. 11 Texas dealerships means we can find any vehicle just for you! New vehicle pricing includes all offers and incentives. Tax, Title and Tags not included in vehicle prices shown and must be paid by the purchaser. While great effort is made to ensure the accuracy of the information on this site, errors do occur so please verify information with a customer service rep. This is easily done by calling us at (888) 311-1268 or by visiting us at the dealership. Why Choose Stanley Chrysler Dodge Jeep Ram Brownfield for 8-Passenger SUVs for Sale in Brownfield? Stanley Chrysler Dodge Jeep Ram Brownfield has a selection of safe, well-equipped 8-passenger SUVs that spans our new and used car inventories. It goes without saying, you won’t have a problem finding the vehicle you need at a price you can afford, especially when you consider that our knowledgeable financiers have access to national lenders and the wiggle room to customize a rate to fit your monthly budget. The savings continue when you consider that they have a comprehensive knowledge of rebates and incentives and will ensure you don’t pay a dime more than you must. To top things off, we offer objective trade valuations based on Kelley Blue Book standards, which means you’ll get every penny of the value for your old car should you want to deduct its worth from your next. Plain and simple, when you choose to shop with Stanley Chrysler Dodge Jeep Ram Brownfield, saving is a cinch. Shoot us a message to set-up your test-drive, and one of our friendly sales staff will guide you through the rest of the process. Stanley Chrysler Dodge Jeep Ram Brownfield	33.1961433, -102.2730978.